Florals are a classic pick (sorry) for interiors. Fresh, inspiring and pretty, they shouldn't just be limited to the bedroom. And for anyone who associates florals room design ideas with ancient hotel bathrooms and their grandparents' living room, it's time to think again: florals are cool. From dark and moody florals to light, modern designs, they have blossomed (again, sorry) into super stylish prints that we want in our homes. You can take our word for it, or you can keep reading and be inspired by these floral room designs ideas. If you are after more beautiful decorating ideas and design tips, head over to our hub page. Dark floral designs are a big trend at the moment. Gone are the saccharine pastel hues you would normal associate with floral designs, this look is about gothic, lush, moody prints in deep inky hues, and we love it. Surface View is our go to for dark romantic floral design; they have a huge collection of wallpaper, mural and ceramic tiles. Love this look? You are going to want to take a look at at these equally gorgeous dark and atmospheric decorating ideas. Floral prints can be all about teeny tiny ditsy prints that are perfect for a vintage feel, but if you choose a design that's big and bold in a limited colour palette, you'll get a really clean, fresh look. We love this print from Urban Walls – florals at their very coolest. If you are a fan of botanical wallpapers, go and check out our ideas for some inspiration, (and yes we count all of them as floral, too). If you are decorating a large room with floral prints, you can definitely get away with using a smaller, more traditional print. And this dining room is proof that just because you have more contemporary furniture, you don't have to shy away from more trad floral prints. This Little Greene wallpaper works perfectly in contrast with the sculptural Mid-century style dining table and chairs. It's definitely more of a statement print than a lot of floral wallpapers, but we love this modern take on the traditional English rose motif. This is literally perfect for anyone who wants to embrace the floral trend but finds that flowers can be a bit too fussy. It costs £126 per roll at Curious Egg. Oooh, isn't this living room divine? It has almost a Scandi feel to it, despite the relatively traditional Sandberg print. The colours are lovely and subtle but add plenty of interest into this grey living room – if you are looking for a floral design that brings a delicate pop of colour, you've found it. Hanging wallpaper in a kitchen in a bit of an usual move, but it's looking to be a big trend this year. Plus it is a pretty cheap way to give your kitchen a new feel and inject a bit of personality into the space. Pick a floral print that complements the colour of your cabinets. Here, the busy print of Cole & Son's Sweet Pea works with the simplicity of the kitchen cabinets. For more inspiring kitchen wallpaper ideas, check out our gallery. For a lovely cohesive look, find a floral print wallpaper that matches the woodwork in the room you a decorating. Or, paint your woodwork to match your wallpaper. For tips on painting doors, windows and choosing the best paint for wood, have a read through our guides. Cute vintage-style prints and brightly colour floral designs are always going to work in a child's bedroom. This Lisa wallpaper from Sandberg, available at Wallpaper Direct, has a gorgeous colour palette that can be used as a solid base when designing a kid's room. Couple with the bold lines of an industrial inspired bed, like this one from Julian Bowen Papplewick, for a more traditional feel. Wallpaper isn't the only way you can bring floral designs into your home. Floral furniture? 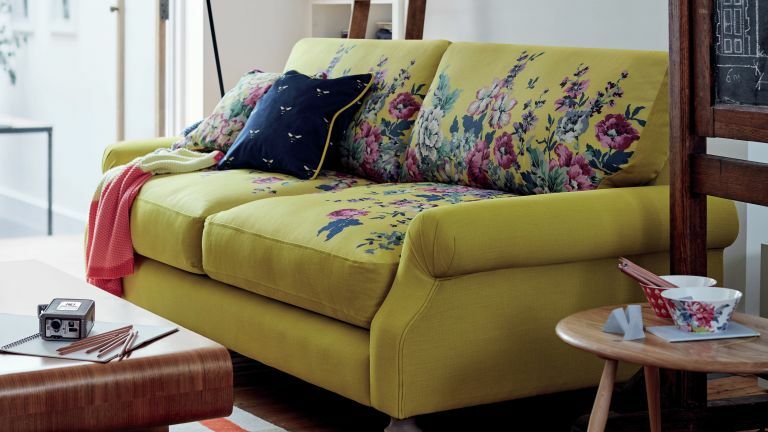 Yes we are fully committing to this flowery trend, starting with the sofa. We love the lime-greeny colour of this DFS sofa, and in the setting of this relatively simple living room it totally works. If you need anymore advice on how to choose a sofa, have a read through our guide. From floral sofas to floral baths. If you want to make a statement in your bathroom choose a floral printed freestanding bath, that would fit perfectly into a more traditional bathroom. Keep the rest of the room simple and neutral to make the bath the central focus. Find more inspiration for traditional freestanding baths in our desgin gallery. if you aren't ready to fully commit to floral, switching up your bed is the perfect way to embrace the trend without going all out with a wallpaper or a piece of furniture. Obviously, there is a ton of floral print bedding out there, but we particularly love this Christy set. Check out more of our favourites in this pick of the best bedlinen. Putting up floral (or just 'nature inspired') prints is really easy, and a not so permanent way to embrace the floral trend. Scour antique shops and charity shops for some old/old-looking paintings and mix them with more contemporary prints to create a gallery wall. Switch up your currently curtains or blinds for a floral print – easy and relatively commitment free. Floral curtains are probably best kept to a bedroom or living room but if you have blinds in your kitchen or dining room, you could change out these too. For more tips on how to choose practical bedroom window treatments, living room window treatments and kitchen window treatments head over to our expert guides.